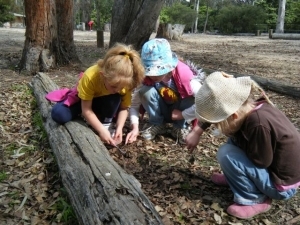 This program is designed for Stage 2 students who are learning about their living world. Students will learn about how animals and plants have a variety of external features that help us to identify and classify living things. Students will undertake fieldwork to identify plants and animals in two different environments (one aquatic, one land based). They will use simple classification systems to identify plants and animals, recording and discussing their results. Life cycles of animals and plants in the two environments will be a focus point for discussion throughout the day. A variety of additional activities are also available to support the learning on the day. 1. How can we use external features of plants and animals to help us to identify and sort living things? 2. What are the life cycles of some living things in our local environment? 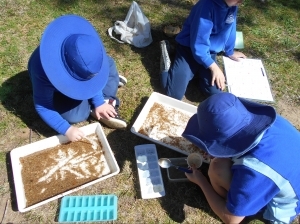 Students explore two different environments at Bournda National Park – one aquatic and one land based. Students learn how to create a small quadrat (sample area) in a dry environment to explore an area for living things. Students are shown how to safely search for and catch bugs. They then use the minibeasts recording sheet with ID drawings to record the number of different types of minibeasts found. Students then record details of one of these minibeasts using the student worksheet. As it is likely that students will encounter minibeasts at different stages of their life cycles this is a great opportunity to explore this concept. All organisms are returned unharmed to their environment. Students walk along the edge of Bournda Lagoon or Wallagoot Lake to a suitable location. Using the dip nets students collect specimens by scooping along the lagoon bed. All contents are emptied into white trays and students sort through specimens found, locating the same species. Students classify into plant and animal groupings. Students then investigate the collected live specimens and complete the classification worksheet. Students play the role of botanists and name and describe some common plants found in Bournda National Park. The students make detailed and accurate observations of the plants and make drawings of their features. Botanical illustrations by the students can include: drawings of leaves and flowers, leaf rubbings, gum-nut drawings and bark rubbings. Students will explore how the features they are studying relate to the plant’s life cycle. Students and teachers are encouraged to explore our fabulous digital herbarium before and after their visit. In pairs students build a sand model of one animal they have investigated during the day. Students also construct a suitable model of the habitat required to provide their model animal with its needs. Once complete students walk around to each model and the students who made the model explain what it is and the habitat required. Students walk along the beach looking for the items listed on an identification sheet that are most frequently found along the shoreline. Students classify items by placing objects into groupings of plant, animal and once alive. Group discussion on the needs of each item that was once living. Living things can be grouped on the basis of observable features and can be distinguished from non-living things. Living things have life cycles.